Line Sandvad Mengers is a visual artist working with cultural value within the areas of social and conceptual art. She works with common objects and projects in which location and participation are key. The works relate to self-representation of individuals, organizations and nations and the concept of truth in relation to identity. Line Sandvad Mengers has exhibited internationally at Art Museums and in public spaces and her work is part of the collection of Danish art foundation. In 2006 she graduated from the Department of Conceptually based Art, Funen Art Academy, DK. 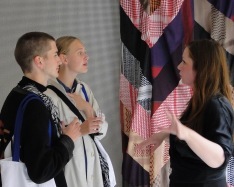 She is currently head of the contemporary program at Vestjyllands Art Pavilion, DK.